The most common questions & answers about our fishing trips. AnswerWe do all types of fishing depending on the conditions at the time. On all trips, full day or half day we do about half the time Trolling (Big Game) and half the time Drift bottom fishing or fishing at anchor on the bottom, which is very productive, and on the hook we bait up with a mixture of dead and fresh caught baits. If however one type of fishing style is proving a lot more productive at the time we will obviously concentrate on that one, that is the advantage of our boat, we have the only boat here that does both styles on every trip.If it is a specialist trip ie. 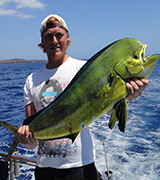 Surface Game Fishing, Rock / Reef Fishing, Fishing at Anchor, Drift Fishing we will concentrate on that style. - What type of fishing do you do? AnswerEvery fisherman has two rods, one for the trolling fishing and one for the bottom fishing for the whole duration of the trip. Many other charter boats will do a "lucky dip" system where you have to wait your turn, not us! - Do you provide all the tackle and bait, will everyone get a rod for themselves? AnswerWe supply a packed lunch of a ham and cheese baguette, packet of crisps, 2 pieces of fruit and a chocolate bar on the full day 7 hour trips plus cold soft drinks, water and beers (in moderation, it's not a 'Booze cruise'), and free cold drinks on the half day 4 hour trip.. - what kind of food and beverages on your trips, is alcohol allowed? AnswerYes,there's no age limit, we just leave it up to you as you know your own kid's best, and will be the better judge of whether they will enjoy it or not. We also have some light tackle if needed. - Are children allowed to fish from your boat? AnswerMost of our catch is released after you have had the opportunity to take a photo. Some of the catch will be eaten by either us or we do offer our customers a share, as we know a lot of the accomadation over here is self-catering and some of you like to sample your fish on a dinner plate - What happens to the fish caught, are we allowed to take some home to eat? AnswerYes, we are regularly inspected by marine engineers and have all obligatory saftey equipment on board plus extra equipment not even required by law for extra security. - Do you supply saftey equipment, ie. lifejackets, liferaft, flares, satellite GPS.tracking etc.? 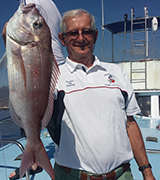 AnswerWe have virtually all year round fishing here. There is always something to target. Obviously the catch rate varies, as that is the nature of fishing. Check out my fish seasons chart by clicking on the 'Fish Seasons' tab at the top of this page. NOTE; The Fish Seasons Chart is currentley being revised. so not all the information is on there at the moment, we are working on it. 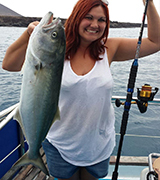 - Whats the best time of year to fish Big Game fish, Marlins, Tuna, Sharks, Snapper , Amberjacks etc. AnswerAbsolutely not, many of our customers are 'First timers' Just giving it a go while on holiday. We set up all the tackle and bait for you and give you any assistance needed. - I have no experience and am a complete novice in sea or boat fishing, is that a problem? AnswerYes we do cater for the professional/experienced angler and can arrange for specialist private charters to target particular species ie. Just Big Game Fishing, Just Bottom Fishing over either rocky ground and edges of shelves or flat bottom, using a variety of baits including fresh caught baits, artificial baits over rough ground or a mix of styles, for either 1 fisherman or groups of anglers. - I am an experienced Game/Sea fisherman/angler, can you accomodate me? AnswerWe will give you the option of either changing for another day, but if thats not possible you are welcome to a full refund. - What if the weather is bad and the trip is cancelled? AnswerAs long as you give us plenty of notice it's normally ok, no less than a week at least, and the date you would like to change to is available. - Can I change my dates I have booked for my fishing trip? AnswerYes, as long as it is good enough for the job, but we do have everything needed, if you have a favourite rod & reel etc. you would like to use, then just bring it along. - Can I use my own tackle, rod, reel, lures, hooks? AnswerNo, we have a 'Collective' fishing license which covers all our passengers for the Big Game fishing and the bottom and shark fishing. - Do I need a fishing license for my fishing trip with you? AnswerYou never know, thats the excitment of fishing! We are set up to catch anything from a small makerel to a giant Marlin! but if you go to my fish seasons tab at the top of this page you will get a good idea of whats about when you are here. - What will we catch, will they be big fish or little ones? AnswerYes there is always an English speaking person on board, mostly Myself, my Son or my partner John and the crew also speak English. - Are there English speaking crew on the boat? AnswerYes we do arrange 'Private Charters' for you to have the boat exclusive for just yourself or a private group, Family/friends etc. You will have to contact us for a quote - Do you do 'Private Charters' for the boat exclusive and if so how much does it cost? AnswerWe can fish any time of day here, and we do not have much change in tide heights in this part of the world. Also the water is very deep all around the coastline so there is no great tidal currents over shallow ground to ruin the fishing. There is one species of tuna called the 'Albacore' which do not like the midday/high Sun, but the rest of the species we target are not affected. - Is it better to fish in the morning or afternoon, low tide, high tide, slack water etc.? AnswerWhen you send me an enquiry, I will send you back the dates and times available whilst you are here, and also give you a link to our booking page where you can make a reservation, or you can go back to our homepage and you will see a tab on the top right saying 'Online Booking' then just follow the instructions . - How do I make a reservation? AnswerNo problem, you can also use 'PayPal' or you can pay directly into my bank account over here in Tenerife or a UK bank account we have. Just ask us for the details and we will send them to you. Or if you prefer you can ask us for a specific date and we will provisionally book you in, and you can contact us when you get here, at least 3 days before the trip, to make a deposit. - I do not have access to a credit or debit card, can I pay my deposit & reserve my trip another way? AnswerThere is a very good sea sickness tablet you can buy over here called 'Biodramina C'. They are very effective and you normally take two 30 minutes before boarding the boat and then even if you feel fine another one halfway through the trip just to be safe. They are available from all the chemists (Pharmacias) here and will give you any advice you may need to know about them, like childrens dosage, if you are pregnant, have high blood pressure etc. etc. - I am worried about 'Sea Sickness' is there anything I can do to prevent it? AnswerWe take a maximum of 10, that's including any spectators who are not fishing. An average number of anglers on board at any one time is 7/8 with a couple of spectators, thats if we are full. All passengers who are fishing get two rods each, one for the trolling and one for the bottom fishing for the whole duration of the trip. - How many passengers do you take out? AnswerWe don't waste any time getting to the fishing grounds beacause as we leave the harbour we immediately set out the trolling lures as the water is very deep close to the coastline. Tenerife is a volcanic island deep in the Atlanctic ocean and we can and have caught very big Game fish in less than a mile from the shore, and when we are bottom fishing we have a lot of choices along the whole of the coast in average depths of between 30 and 100 mts and that is no further than 1/2 a kilometer from coast. Also we have all the tackle and baits set up along the boat so when we stop the trolling we start the bottom fishing straight away. - How much time is actually spent fishing on the trip? Is it a long journey to the fishing grounds? Answer We also do a trip where you can spend about half the time trolling fishing and half the time anchored up in a small bay, where you can relax, have a swim, sunbath and if you want, do some light tackle fishing , while we cook up some hot lunch and buffet. This type of trip suits a Half or Full Day 'Private Charter' best, and we can cater for up to 10 people. Contact us for a quote on the price. - Do you only do fishing trips?